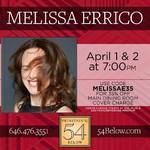 I first spoke with Tony nominee Melissa Errico in November 2015 on the heels of her premiering Sing The Silence at Joe's Pub. After that interview and show, I was delighted to receive Melissa's call again to discuss her newest show Funny! I'm a Woman with Children, making its debut at Feinstein's/54 Below this Friday, April 1 and Saturday, April 2 at 7pm!